I did two Dissertation projects for my BSc – this was for the Physics component. I wrote and tested an interpretation of the Separating Axis Theorem in C. The Separating Axis Theorem is an implementation of the Hyperplane Separation Theorem used for detecting intersections in 2D and 3D, making it a useful efficient method for detecting collisions in games. You can read my Dissertation here, or download the project at my GitHub here. At the end of this project, I received a First grade for it. In this project I used the C programming language to write a program called Collision Checker. 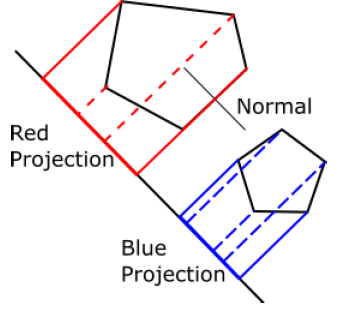 This program can read and interpret 2D polygonal shapes, check that these shapes were valid and convex, and then compare these shapes with each other for collision. This program is part of a significantly larger project: a key feature is that it is designed to be passed to the university upon completion for use in future projects dealing with hardbody packing problems or 2D computational geometry. As such it was important that the program be clear and easy to understand, with comprehensive explanatory comments. After writing this program I performed a suite of tests on it, and utilised it on some simple collision checks involving scaling polygons to fit inside other polygons.